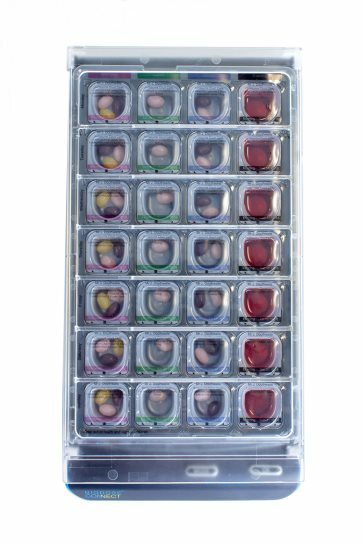 To help patients adhere to complex medication regimes, Biodose ConnectTM comes with a removable Biodose® tray that is split into 28 compartments (or ‘pods’) with each holding up to 10ml of liquid medication or up to seven solid dose medications. The tray can be used to store and organize pre-measured medications for seven days with four pods per day. Sealed, labelled and dispensed by our network of community pharmacies, each tray has individually labelled, removable pods that help patients to take their medications as prescribed. This takes away the hassle of managing multiple medications. While the device stays with the patient, empty trays are refilled with medicines by a nominated pharmacy. Designed with user independence in mind, empty trays can then be removed and replaced by the patient with ease. For added reassurance, a voice alert will sound to confirm that the replacement tray is in place and the lid is shut. To reduce the risk of missing doses, the nominated pharmacy will devise a tailored programme of alerts for each patient’s needs. These include flashing lights under each pod as well as customizable alarms and voice messages to indicate when a dose is due. Further patient preferences such as emails and text messages can be programmed and stored securely on the Biodose ConnectTM database. If medication is not removed after a configured time, chosen contacts such as a nominated carer or consenting healthcare professional may receive a further customized alert. How does Biodose Connect work?